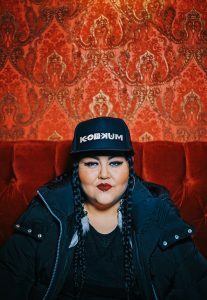 Cheyanna Kootenhayoo also known as DJ Kookum is a Dene/Cree Filmmaker and DJ. She is a member of the Alexis Nakota Sioux Nation, originally from Cold Lake First Nations and is based out of Vancouver, BC. This hip hop, rap, trap, r&b, edm DJ is blowing up. This past year Kookum has opened for Princess Nokia. Threw down a back-to-back set with Dj Shub at the celebration of lights festival. Held it down on the decks at the first Vancouver Indigenous Fashion week and at the 18th Annual ImagineNATIVE Film & Media Arts Festival in Toronto. She is also a resident DJ at the Biltmore Cabaret Friday nights and was nominated for break out DJ of the year at the Golden Owl Awards. Between DJing and Filmmaking, she will be working on cooking em beats in music production, stay tuned!